On Sunday, just one day before the prankfest of April 1, Burger King debuted an expletive-laced video featuring “real” customers chowing down on its iconic Whopper burger — and then finding out the beef-style patties they had just enjoyed were actually plant-based patties created by Impossible Foods. “You’re f**king kidding me,” one customer insisted. But Burger King claims the Impossible Whopper is real, and that it’s going to play a major role in the company’s future. 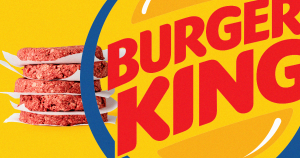 “I have high expectations that it’s going to be big business, not just a niche product,” Burger King’s chief marketing officer Fernando Machado told The New York Times. To start, the meatless Whopper will be available at just 59 Burger King locations in the St. Louis, Mo., area, according to a press release. However, if the St. Louis debut goes smoothly, Machado told The Times that the company plans to roll it out to all 7,200 or so of its locations in the United States. That means customers all across the nation could soon have the option of choosing a healthier, more environmentally friendly alternative to Burger King’s flagship sandwich — and if it tastes as good as the original, as the customers in the video claim, there’s a solid chance they’ll actually opt to try a meatless Whopper.